Of all the people who showed up to wish Jon Stewart farewell, Stephen Colbert’s heartfelt goodbye was the best tribute of the night. He’s arguably the most successful of the Daily Show alums, and he was the last of the former correspondents to come out and say goodbye to Stewart, using an elaborate Lord of the Rings metaphor and the blowhard persona he developed on The Daily Show. But, after the scripted bit was over, when Stewart threw to commercial, Colbert interrupted—clearly planned between him and the control room but a surprise to Stewart—and offered a spontaneous goodbye in his own voice. It was the most emotional Stewart got during the night, as Colbert said, “You said to me, and to many other people here years ago, never to thank you, because we owe you nothing. It is one of the few times I’ve known you to be dead wrong. 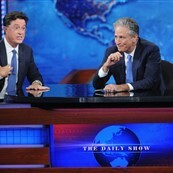 We owe you […] because we learned from you.” He thanked Stewart for not only the opportunity being on The Daily Show represented, but also the example Stewart set, as a host and a boss. Looking at the number of former correspondents who have gone on to host their own shows, including Colbert and Trevor Noah who will take over Stewart’s desk, and it’s not hard to see the impact Stewart has had on so many people. Speaking of hosting, Colbert also announced yesterday that George Clooney will be his first guest on September 8 when he begins his own reign as captain of The Late Show. That’s a good start—Clooney is a good guest. But it’s his tribute to Stewart that stands out this morning. 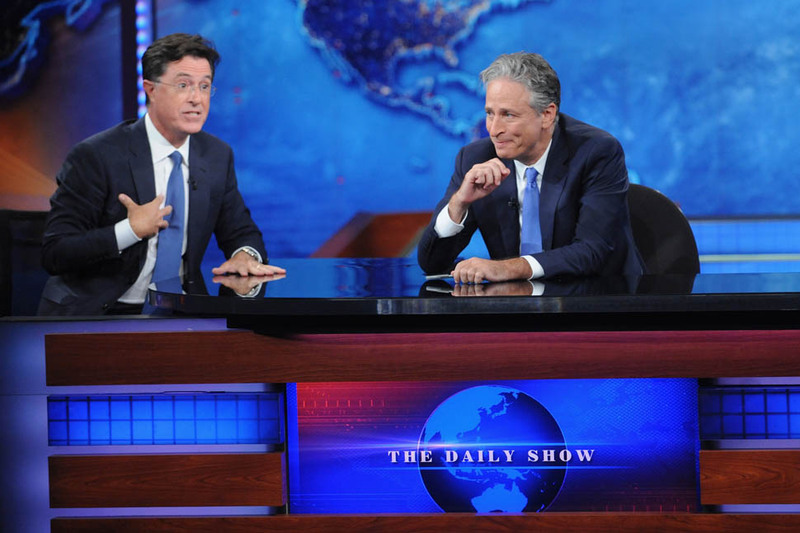 As Colbert said to Stewart, “You are infuriatingly good at your job.” That’s probably the best summation of Jon Stewart’s sixteen year tenure at The Daily Show—infuriatingly good.